The Oscar triumph of Green Book and box office success of The Upside reflects a thirst among some movie-goers for stories about racial harmony. The Best of Enemies arrives into this environment intent on hydrating psyches parched by the race-related cultural strife of the late 2010s. Like Green Book, the movie mines a “based on true story” narrative in service of a production that is part history lesson, part character piece, and part message-oriented tract. My sense is that, while The Best of Enemies may be met by stinging criticism from the far left and far right (for different reasons), those with centrist leanings will appreciate it for what it is (as opposed to for what it isn’t). The degree to which the fact-based story embraces the historical details is uncertain but the skeleton of the screenplay checks out. And, while the movie is indeed about a die-hard racist experiencing a change-of-heart and repudiating his previous beliefs, it never resorts to the kind of patronizing inspiration that has tripped up more than a few of these well-intentioned productions. Although the screen transformation is less nuanced than the real-life one was, the filmmakers show it happening in stages rather than in an all-at-once “magical” moment. 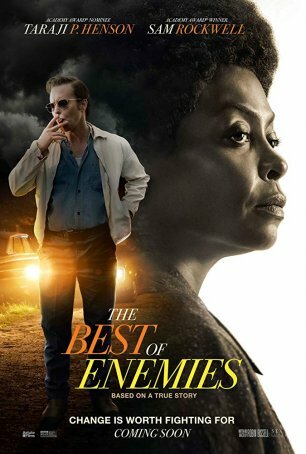 The Best of Enemies gets into the head of C.P. Ellis (Sam Rockwell) and, after showing the ugliness there, charts his course to redemption. The movie is set in 1971 Durham, North Carolina. Despite court-mandated national integration, Durham is holding out as a bastion of segregation until an electrical fire at the black high school forces the issue. Enter a community organizer, Bill Riddick (Babou Ceesay), who arranges for the citizens of Durham – black and white – to come together in a charrette that will assemble a list of proposals for adoption by the City Council. As co-chairs, he chooses Ellis, an Exalted Cyclops of the Durham KKK, and in-your-face black activist Ann Atwater (Taraji P. Henson). The two hate one another and continue to show mutual antipathy until late in the proceedings. Ellis, who has connections to the head of the City Council (Bruce McGill), believes that by working from the inside, he can extend Durham’s segregation. He needs only five votes (out of 12) on the charrette “Senate” to block the resolution. Four are in the bag. Getting the fifth requires strong-arm tactics that, when turned against a Vietnam Vet, cause Ellis to question his philosophy of what it means to help others. Meanwhile, Atwater, whose first inclination is to lash out at anyone and anything standing in her way, uses her status in the black community to mobilize support. She’s also not beyond a little subtle manipulation such as pulling strings to help Ellis’ institutionalized son (who appears to be a Down syndrome sufferer) get a private room.